Horseshoe Bay Resort, one of the most dynamic golf resorts in the country and the original lakeside resort destination in the state of Texas, has selected Kevin Frisch PR to manage its golf public relations. Kevin Frisch PR will develop and implement media and marketing strategies to promote the world-class golf product and elevate the acclaimed resort as a leading national golf destination. Horseshoe Bay Resort is home to four championship courses designed by World Golf Hall of Fame members Robert Trent Jones Sr, and Jack Nicklaus, as well as an 18-hole natural grass putting course and golf academy. Horseshoe Bay Resort is in the finishing stages of a $70-million renovation, which, in addition to major resort and room upgrades, includes extensive renovations on its Slick Rock, Ram Rock and Apple Rock golf courses. The new state-of-the-art Cap Rock members clubhouse is being constructed to overlook the Ram Rock and Apple Rock courses and a panoramic expanse of scenic Texas Hill Country. The Apple Rock course and clubhouse will open in the spring of 2019. In 1971 Robert Trent Jones Sr. built the first golf course, Slick Rock, at Horseshoe Bay Resort. It features a classic parkland setting and classic elements of Jones’ renowned architectural sensibility. The Texas State Open was played on Slick Rock with golfing legend Ben Crenshaw winning it three times. A wall-to-wall renovation in 2016 included upgrading tees, greens, bunkers and irrigation, as well as the awe-inspiring “Million Dollar Hole” where golfers follow a winding path across a 35-yard rock- walled waterfall. A decade after Slick Rock’s debut, the resort brought Jones back to design one of the toughest courses in Texas. Ram Rock, which became known as “The Challenger,” has also hosted the Texas State Open. Integral to Ram Rock’s 2018 renovation was enhancing playability from the middle and forward tees while maintaining the layout’s legendary challenge for scratch players. The Apple Rock course, also designed by Jones Sr., opened in 1985 and offers some of the most picturesque views at the resort. Jones strategically routed holes to take advantage of the many higher elevation points that overlook Horseshoe Bay Resort and Lake LBJ. Apple Rock is currently closed and undergoing a major renovation but is scheduled to re-open in the spring of 2019. The Summit Rock course opened in 2012 and is an elevated members-only experience at Horseshoe Bay Resort. 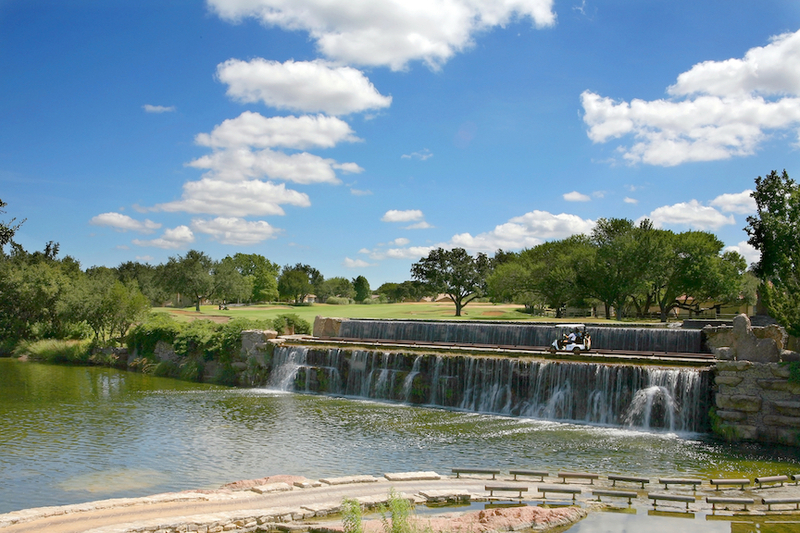 A Jack Nicklaus Signature design, it features some of the most stunning scenery in Texas. Nicklaus routed holes along a high ridge, a setting that showcases spectacular views that stretch for more than 40 miles over the Texas Hill Country and Lake LBJ. Complimenting the championship golf is the highly-unique Whitewater Putting Course, a tropically-adorned 18-hole day/night real-grass putting course that sits adjacent to the hotel and is routed around the energetic 360 Sports Club (A full-service destination for pub food, cocktails and live sports on more than two dozen flat screen TVs). It is the perfect attraction for golf buddy groups, couples and families. For more than two decades, Kevin Frisch PR, formally Fusion Media Strategies, has been an industry leader in golf and resort public relations and marketing. The cutting-edge firm has exposed millions of consumers to brands through effective media strategies for the golf, travel, lifestyle and sports industries, including golf courses, golf resort destinations, golf products and technology, golf real estate, state tourism bureaus, golf academies, and sports franchises. Additionally, Kevin Frisch PR is an industry consultant on golf operations, business development, course rating strategies and providing professional golf, lifestyle, architectural, and sports photography. Its growing base of clients includes Boyne Resorts, Forest Dunes, State of Michigan, French Lick Resort, Island Resort & Casino, Horseshoe Bay Resort, Mistwood Golf Club, TGA Premier Golf, V1 Sports, and NextLinks to name a few. Visit www.kevinfrischpr.com.